The Australian Competition and Consumer Commission (ACCC) has taken Apple to court over misleading and deceptive practices associated with ‘4G’ claims with respect to the new iPad. The ACCC alleges that Apple’s recent promotion of the new “iPad with WiFi + 4G” is misleading because it represents to Australian consumers that the product “iPad with WiFi + 4G” can, with a SIM card, connect to a 4G mobile data network in Australia, when this is not the case. The ACCC alleges that Apple’s conduct contravenes sections 18, 29(1)(a), 29(1)(g) and 33 of the ACL. The ACCC is seeking urgent interlocutory relief to ensure consumers are made aware of the correct technical capabilities of this device. Additionally the ACCC is seeking final orders including injunctions, pecuniary penalties, corrective advertising and refunds to consumers affected. Consumers who have purchased or are considering purchasing an “iPad with WiFi + 4G” should ensure that they have a proper understanding of the mobile data networks which this iPad can directly access by a SIM card. Tomorrow, the claim will be heard and one possibility is that the new iPad models have to be pulled because of their name. It is not that easy to glean from the ACCC or news reports what precisely is going on but let me take an educated guess. At the moment, in Australia, there is only one 4G network — Telstra’s — but that operates on a different bandwidth than the new iPad. What is unclear is what the future prospects are for an LTE network in Australia at the iPad’s frequencies. But right now, if you buy an iPad you can get 3G speeds but 4G only if you travel to the US or Canada. The issue, of course, is not that but precisely how Apple (and others) communicate that to consumers. Let me just preface my remarks here by saying that I am in full agreement with a law that prevents deceptive and misleading conduct. Moreover, I believe it should apply to all. But what I am going to argue is that the way the ACCC appears to be going about it in this case may have some important unintended consequences — hence, the title of this post about globalisation. Let’s begin with the representations made by Apple. I couldn’t find a TV ad that involved 4G claims but I did look at Apple’s website. Here is the site and here is a screenshot. There is no mention of LTE networks in the main text and the *’d footnote reads “4G LTE is supported only on AT&T and Verizon networks in the US; and on Bell, Rogers and Telus networks in Canada. Data plans sold separately. See your carrier for details.” So this is clearer. 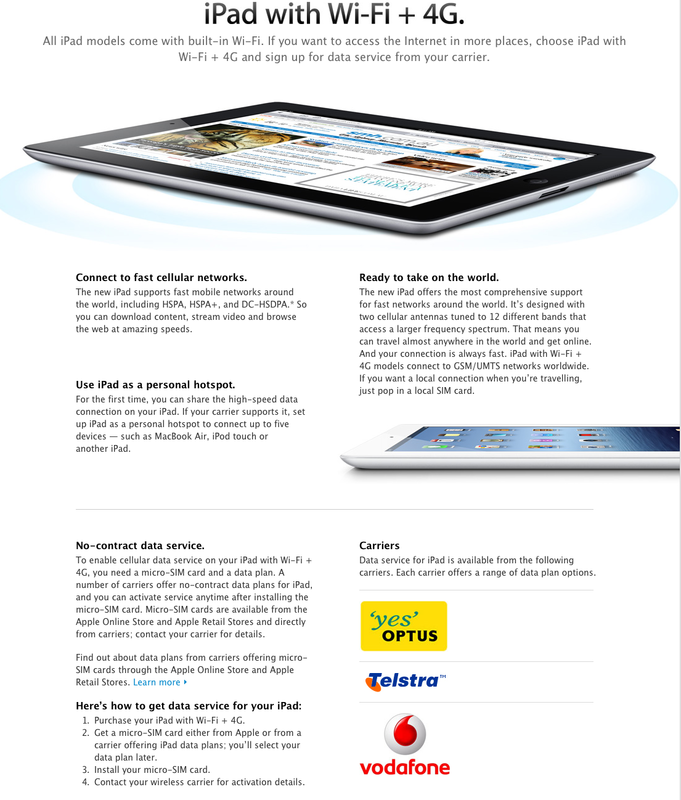 Telstra is the only one not to label the new iPad with 4G. Optus and Vodafone do but neither have the HSPA+ network. Telstra do and they claim speeds up to 20Mbps. When I traveled in the US recently with my iPhone 4S, that showed the label ‘4G’ because of that HSPA+ network and those speeds. It isn’t LTE but Apple are calling that 4G. Finally [update from original] Apple actually put a warning on the device itself for Australia. That’s too late if you ordered by post but it is enough to get you to return it if you were confused. If Apple are being misleading then so are Optus and Vodafone. Indeed, as the carriers with the slowest speeds and the people in charge of selling the mobile data service they are surely the prime targets here. But there is no mention of them in the ACCC claim. Telstra, on the other hand, have not used the label but perhaps would be justified in using it. Certainly access to their networks is enough to arguably justify the ‘4G’ label. To consumers, this is not an issue of what precise spectrum or technology they use but can they achieve fast downloads. The ACCC will have to show that consumers cannot pop in a Telstra SIM and achieve fast downloads. Here, in Canada, on Rogers I get the LTE label and the best I have seen thusfar on my new iPad is 7Mbps. You can still take your new iPad to the US and Canada and access LTE networks there. To be sure, if it was not possible or ever possible to achieve ‘4G’ speeds in Australia with the new iPad the label is a problem. But that doesn’t seem to be the case from what I can understand here. By the way, this isn’t me being just pro-Apple. A few years back I was very distressed about Apple’s advertising for the Apple TV in Australia. Here is the post I wrote about it. Basically, they were showing ads saying you could watch TV programs on Apple TV when they were not available in Australia and what is more Australians could not (legally) purchase that content. Those ads were not changed for months and it was over a year later before some TV programs started showing up. I complained to the ACCC at the time and they did nothing about this. It appears to be much more serious than the current claims. So there is some confusion here but it isn’t just Apple. Why are the ACCC just targeting them? It is strange to say the least. But even with the confusion has Apple failed to rectify consumer complaints. Apple will accept returns from unsatisfied iPad customers 10 days after purchase. It was launched March 16 and the ACCC action was March 26. Who complained about not being able to return the iPad? Why is the ACCC asking for refunds to be given when Apple give them? What is the puzzle here is why this has ended up publicly and in Court? 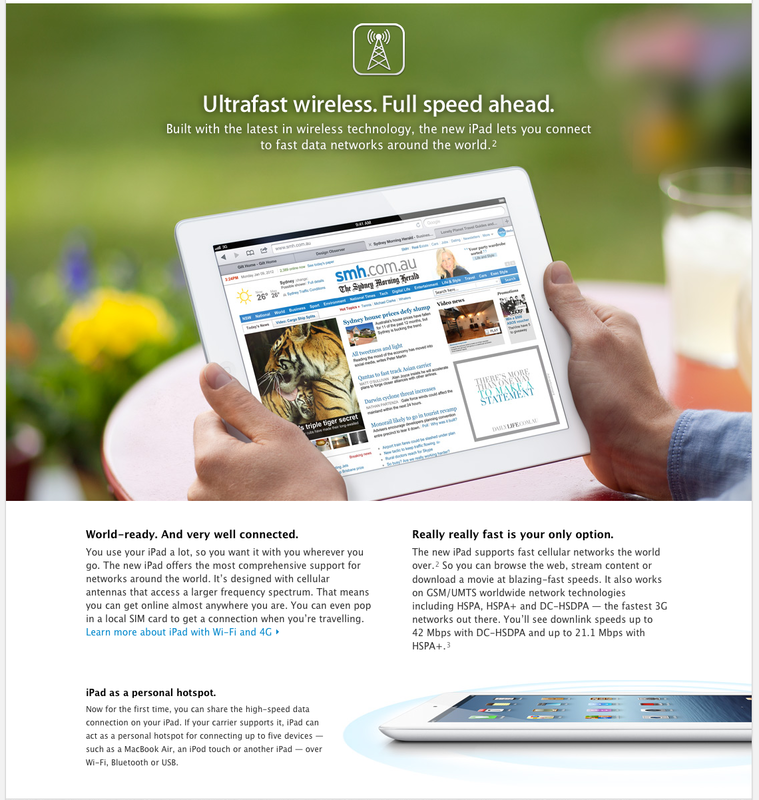 The only thing I can point to is that the ACCC wants the name of the new iPad to be changed and the 4G label dropped. That means changing the website, advertising and packaging. That is costly. But OK suppose the ACCC gets that. Apple changes the name somehow. Think about what that means for new products — for instance, the next iPhone that will likely support LTE. It means that Apple cannot afford to launch the product in Australia at the same time as the rest of the world. It will have to be delayed while Australia-specific issues are sorted out and approved. To be sure, that will protect people who might otherwise be confused but there is an obvious cost; delay. I’m willing to guess there are plenty of consumers who won’t want that. It has been a struggle for Australia to be served in a timely manner by multi-national companies such as Apple. We have always had to wait years for stuff. Now Apple pushes us to global launch day and this is what happens: a public relations nightmare and world news. That could have been avoided by a negotiated outcome with appropriate product disclaimers. Instead, Apple are facing penalties for the last couple of weeks of marketing that could so easily be avoided by not launching the iPad in Australia until a month or two later. What is more. With respect to Australian mobile communications, Apple are the good guys. They didn’t offer the iPhone exclusively to one carrier — it could so easily have happened. Australia was one of the first places to get an official unlocked iPhone and the first without a regulatory requirement. The iPad was launched as an unlocked device around the world allowing Australian travellers to actually take it with them internationally and not be screwed on data charges. And Siri actually launched with Australian recognition. Not even Canada has that! In conclusion, the ACCC has, I believe, unfairly targeted just Apple in this matter (some carriers should be included and if you don’t include Telstra you have to explain why because the package still says ‘4G’). It is not at all clear that given Telstra’s network the claim is justified. And, it would seem to me that there was opportunity for the ACCC to work with Apple rather than flying to Court but I must admit there may be more to that than is publicly available. But the broader point is that the ACCC needs to be sensitive to the difficulties of global product launches and compliance with local laws. Of course, companies should comply but in choosing the means of enforcement, the ACCC changes the incentives of those companies to include Australia. That is a cost that they need to consider in these matters. 4G is a misleading term in itself. According to the original ITU standard, it was for technologies capable of up to 100Mbps. Now it’s reserved for technology which can’t do that, such as LTE, but is significantly faster than 3G. Personally I’d argue Telstra’s HSPA+ network is that (when it work), and especially after I benchmarked my 3G Telstra modem against my wife’s 4G. (sorry if this posts twice, the telstra network is, however, very poor on the North Shore train line). I would suggest that the reason that Telstra doesn’t give prominence to the “4G” label is that due to its history, Telstra is now very risk-averse on competition law issues. I’m surprised that Optus has given prominance to the 4G labels, and ‘Ultrafast wireless’, given its history in broadband speed claims. The International Telecommunications Union (ITU) expanded the term 4G to include WiMAX, LTE and HSPA+. Didn’t the ACCC get the memo? You really need to study law before you comment on this case. You have made a lot of poor assumptions which a first year law student would know are wrong. I’m more worried about the inability to set anything other than Safari as the default browser. That’s a serious anti-trust issue, as is the lack of support for Flash, and are a few other things about Apple’s operation. But with more prominent warnings, this isn’t so bad; especially if the ITU really has included HSPA+ in it’s definition of 4G. This said, the whole “needs new packaging, etc” argument is somewhat bogus, given that many markets would require native language packaging. Given that there are a number of markets where this device can not operate in 4G mode, surely a name not including “4G” should have been available for use in these places. Lack of Flash? Even Adobe has given up on Flash. “Adobe has given up on Flash” – wouldn’t that be Apple’s fault in the first place? I think Adobe incompetance has got a lot to do with it.